You might think I’m stuck on the putting green again this month but, I start there and move on to other bad practices on the course. They don’t break the Rules of Golf but aren’t a good idea. We often see our ladies clean mud from their golf ball, by rubbing it on the putting green surface beside their ball-marker, I started to think of other bad practices that we often see on our golf course, which do not incur a penalty, but should definitely be discouraged. Here are a few. Cleaning a ball by rubbing it on the putting green. This is permitted (Decision 16-1d/5), providing the act is not for the purpose of testing the surface of the putting green. However, it is recommended that a ball be cleaned in other ways to eliminate any question as to the player’s intentions. 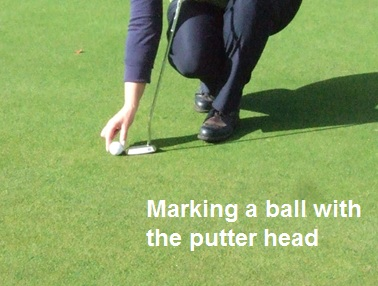 Using a putter head, a tee or a loose impediment to mark a ball on the putting green (Decision 20-1/16). Players should always use a coin, ball-marker or other similar object for this purpose. Placing a club, usually a putter, in front of a ball when addressing it. (I addressed this last month) Even though this unusual pre-shot routine means that the player is touching their line of putt on the putting green, it does not incur a penalty. Rule 16-1(ii) specifically permits this action, providing the player does not press anything down. If they do press their club down on the ground as they address their ball they incur a penalty under Rule 13-2. Standing behind a fellow competitor while he makes his stroke. Again this action does not breach any Rule, but it is extremely poor etiquette. Players should never stand close to or directly behind the line of play, or directly behind the hole, when a fellow competitor or opponent is about to play. Not entering the player’s score on the score card after each hole when acting as their marker. Some markers only update the card every 3rd/4th hole, or even wait until the end of a round. There is no penalty for this, but the Rules say that the marker should check the score with the competitor and record it at the end of each hole (Rule 6-6a). Lastly, not putting recognisable identification marks on your ball. Time and again players find that they are not able to positively identify their ball in play. Rule 12-2 states that each player should put an identification mark on his ball. These bad practices on the golf course can annoy us all. Try to avoid them so we can all enjoy our rounds of golf.